A level I made for SVLC 2016. You know, this one looks kind of interesting, I like the idea for the ice castle. I find it unfair that Wraith gave this a 0 over the boss' language. If I'd judge this level I'd give it a 6 at least. Seriously it's very well designed and keeps things interesting. 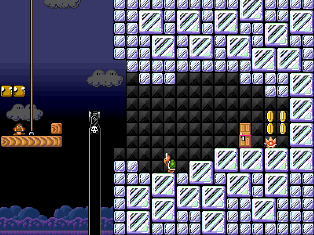 The whole level is a throwback to the actual SMB3 as well, as I remember seeing one fortress level that was built only of ice. When did the SLVC contest get hosted anyway? He mistyped in the title. Overall, this was an amazingly designed stage! It reminded me a lot of one of SMA4's World E levels, which had a similar concept to your level! 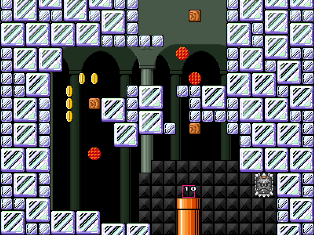 As for the level itself, it's great, and it really felt like I was playing a classic SMB3 castle level! The level desing was awesome, presenting many fun ideas such as the ice blocks and the fairy powerup, as well as feeling right at home with the SMB3/SMW castle levels! 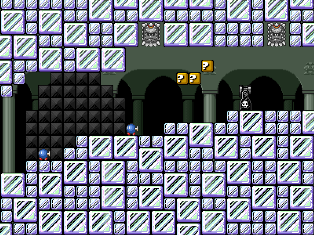 The level was also really pretty, with lots of cool looking ice patterns, but there were some minor clashing, such as with the checkpoint, and in the bonus room, but that was understandable as this was a vanilla level. The boss was also pretty good, but I do think that the dialouge is kinda weird, especially for a classic stage! Overall, this level was great! 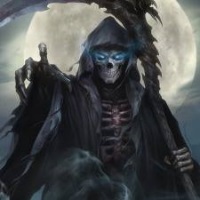 It presented alot of fun ideas, and used them very well! I definetly recommend you give this level a go!